Design Studio C, Ltd. has been offering simple elegant solutions for our clients for over 17 years. We are a business-focused Architect led Design/Build firm specializing in Remodeling, Redeveloping and Refurbishing existing buildings, serving both residential and light commercial clients. We are located in downtown Libertyville, Illinois, to conveniently service Chicago’s North Shore, South East Wisconsin as well as the Chicago metropolitan area. All projects are unique and our fees are based on the nature and complexity of the work. However, most projects will follow the following fee structure for architectural services; which total about 8%-15% of the construction project cost. We offer this valuable service to new clients. A design consultation gives you an architect’s expertise for a limited time at a reasonable price. One time fee of $350.00. Field Measure the existing spaces to be remodeled. 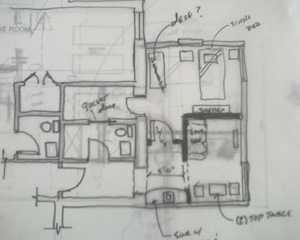 Plan and Elevations: Time and Materials at $110.00 per hour. Time and Materials at $110.00-$210.00 per hour. Typically 2%-4% of the total Cost of Construction. Development of Construction Documents for the scope of work to be constructed. Typically 5%-8% of the total Cost of Construction. Time and Materials at $150.00 per hour. Design Studio C, Ltd. will assist you in obtaining either competitive bids or negotiated proposals and assist you in awarding contracts for the Work. We will also schedule and be present for a pre-bid walk- through of the project to better familiarize the contractors with the work to be completed. After receipt of the proposals we will compile a summary sheet of the results and meet with you to discuss each of the received proposals in detail. After the selection of the contractor we will assist you in preparing a contract for construction of the work. Time and Materials at $150.00 per hour – Two hour Minimum. Weekly Administration of the contract between the Owner and the General Contractor. Between 5% and 10% cost of construction. Varies by project scope and Owner’s needs. © 2019 Design Studio C, Ltd.